For the past two years I have been consulting with a vegetable grower in Salinas, CA on improving the sharpening methods used in the fields. Currently a vegetable cutter will spend up to an hour thinning and sharpening a new knife before using it in the field, then he will spend several minutes sharpening it at each break every day. Sharpeners used range from stones to files to steels. My client wanted to reduce this labor for the harvesters and produce a sharper, more consistent edge. A fringe benefit would be to reduce the cutter's resistance to using stainless steel knives. Stainless knives are being encouraged by the Ag. Dept., but the cutters realize they are more difficult to sharpen. 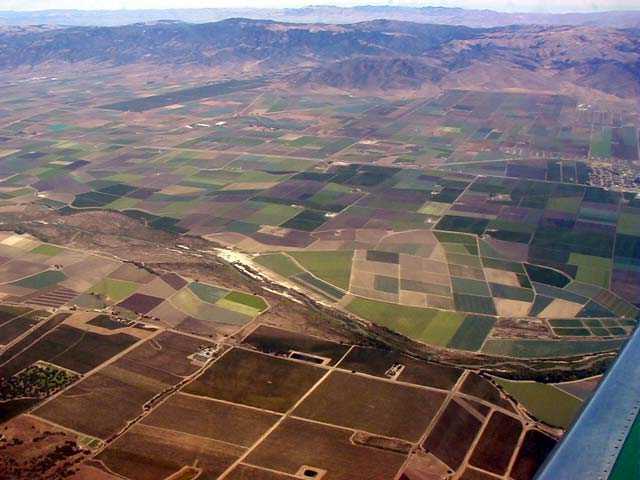 The Salinas Valley sits between the Gabilan mountain range on the east and the Sierra de Salinas hills on the west. Up the valley the Sierra de Salinas peter out and the valley widens over to the San Lucia mountain range. 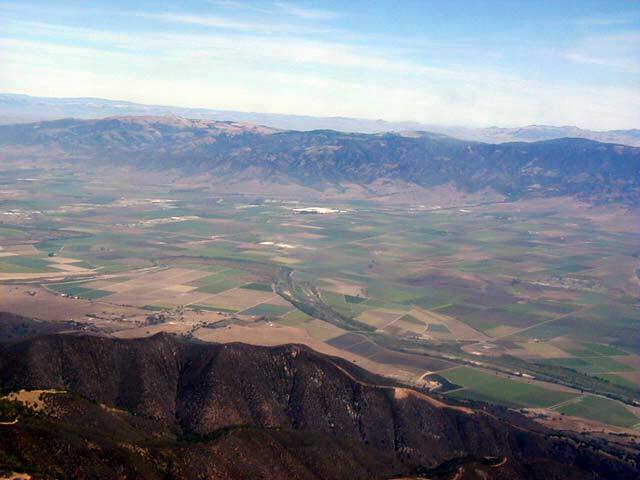 The Salinas River flows northerly through the valley 150 miles to the Monterey Bay. US 101 roughly parallels the river through the valley. 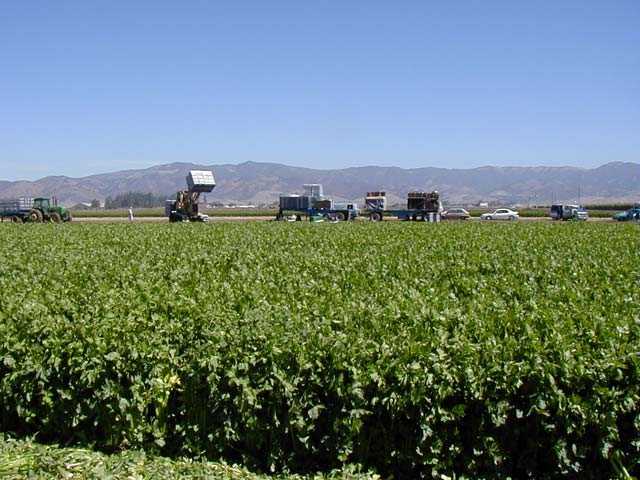 Most of the farm land is in the wide northern section of the valley between San Lucas and Castroville, while the southern end has many vineyards. Salinas, a city of 150,000 and seat of Monterey County, is 20 miles east of the city of Monterey. Seen from the air the valley is a mosaic of fields that produce fruits and vegetables from artichokes to zucchini. Okay, zucchini is an exaggeration, but overall it is the nation's top vegetable and wine grape producing region, and leads the world in seed technology, growing and harvesting methods, and processing technology. While we also worked on head and romaine lettuce, broccoli and cauliflower, the celery knife was the most challenging. 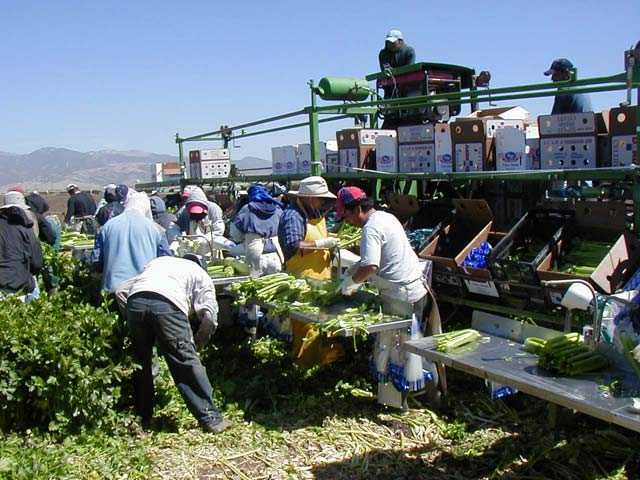 A celery field being harvested. First the celery stalk is cut from the root, then the root end is trimmed. Then the stalk is cut to length. Harvesting up to 3000 stalks a day, the cutter makes between 12000 and 20000 cuts. The cutters (below, left) pass the stalks to the packers (center) where they are washed, wrapped and boxed (right). The boxes are put on skids and loaded on trucks. With all the processing done in the field, all that remains is refrigeration and shipping. The harvesting machines are 50 ft. wide and cover 12 to 16 rows, and 100 ft. machines are in development. Each crew has 12 - 16 cutters and an equal number of packers, plus drivers and handlers. Some crops, like cauliflower and broccoli, are harvested with butcher knives, and even the lettuce knife is not that much different. The celery knife, below, is unusual. It evolved just for this crop, and is not used for any other. The tip is rotated 90 degrees and angled for cutting the root. 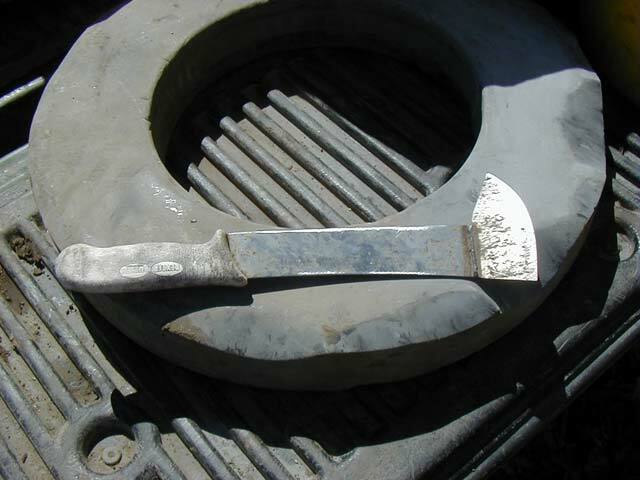 Although these knives have been made from scratch, most are made by cutting and welding butcher knives as below. It has two sharp edges, the tip and the side. Here one cutter is sharpening the edge while another is sharpening a well worn tip. The top side is ground flat while the bottom side is convex - a sort of modified chisel grind. Our challenge was to find a sharpening method that could be used in the field. Another consultant from the meat packing industry walked away from this because the farmers did not have a sharpening room. 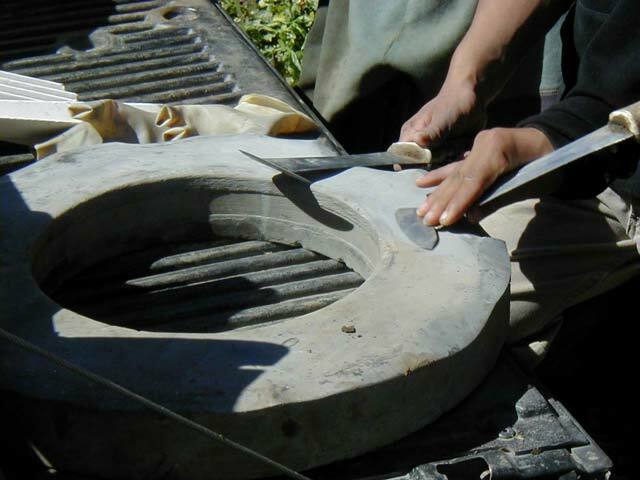 As I mentioned, stones, files and steels were being used and, in the picture above, a salvaged industrial grinding wheel. Electric power was available of some of the harvesting equipment, and my client was willing to add a generator to the others. We experimented with a variety of sharpeners - slot devices, wet and dry grinders - an finally settled on a belt sharpener after it was observed that the small motor could be replaced with a 12V motor and used right at one of the trucks in the field. 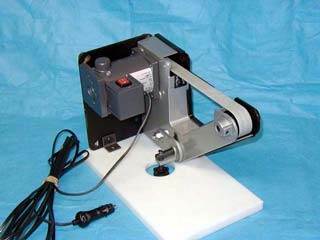 The other advantages of a belt sharpener are that belts are easily changed, and there is both a straight section for flat bevels and a slack belt section for convex bevels. We bought a small motor and modified ours that same day. It turned out to be under powered and the sharpener we were using is no longer available, but it got us off to a good start. Cutters like their knives to be very thin and sharpened to a 15 degree single bevel (chisel grind). The initial preparation of a new celery knife, taking off the original double bevel, thinning and sharpening, took about an hour manually. With this sharpener it can be done in under 5 minutes. Sharpenings throughout the day take just seconds. Our project has been a success!